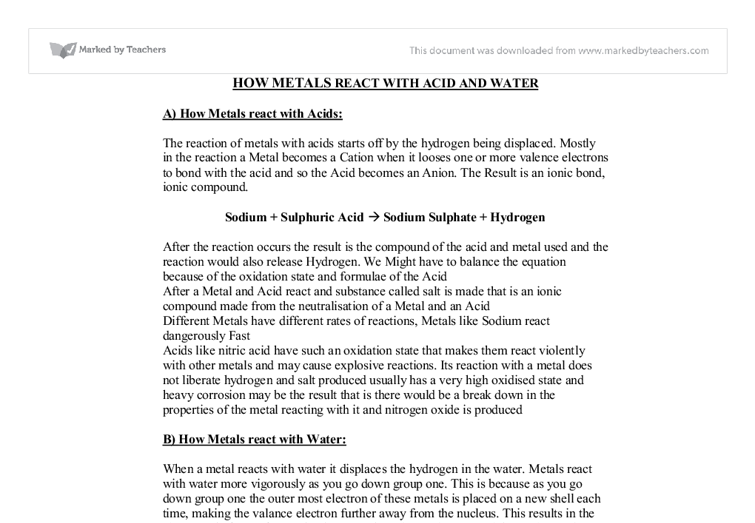 HOW METALS REACT WITH ACID AND WATER A) How Metals react with Acids: The reaction of metals with acids starts off by the hydrogen being displaced. Mostly in the reaction a Metal becomes a Cation when it looses one or more valence electrons to bond with the acid and so the Acid becomes an Anion. The Result is an ionic bond, ionic compound. Sodium + Sulphuric Acid --> Sodium Sulphate + Hydrogen After the reaction occurs the result is the compound of the acid and metal used and the reaction would also release Hydrogen. We Might have to balance the equation because of the oxidation state and formulae of the Acid After a Metal and Acid react and substance called salt is made that is an ...read more. Metals react with water more vigorously as you go down group one. This is because as you go down group one the outer most electron of these metals is placed on a new shell each time, making the valance electron further away from the nucleus. This results in the electrostatic force of attraction between the valence electron and the nucleus to be weak. Placing a valence electron on a new shell also means that there is more repelling of the valence electrons from the inner shells. So the further away a valence electron if from the nucleus and the more shells there are the easier it is for the metals to loose that electron. ...read more. 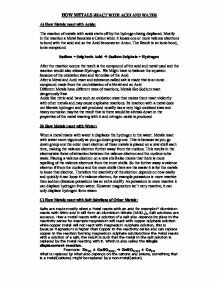 forming magnesium sulphate solutionOnce the Metal reacts with a solution of a salt, the result is such that the metal in the salt solution is replaced by the metal reacting with it. Which is also called the Single displacement reaction. Example: Zn(s) + CuSO4(aq) --> ZnSO4(aq) + Cu(s) What is replaced by what also depends on the cations and anions, something that is a metal(cations) might be replaced by a non-metal(anion) We Can see in this Reaction that Bromine that is a metal(Cation) is replaced by Chlorine non-metal(Anion) Example : Cl2 + 2NaBr � 2NaCl + Br2 The Ions that are left after a reaction and have not been reacted with anything are called spectators, This is because they might not be soluble in the solution made ...read more. Testing for anions (Substance I) 1. A small spatula of substance I was added to a test tube, along with 2 dropfulls of dilute hydrochloric acid. 2. Using a Bunsen burner the test tube was placed into a blue flame and warmed gently. This should have ensured that my average titre was an accurate value for the acid used and not affected by any anomalous results. * When I was making up the solution of sodium carbonate, I washed out all equipment used more than once, adding the washings to my solution. combustion: N2 + 2O2 --> 2NO2 N2 + O2 --> 2NO NOx emissions are formed from fuels that contain nitrogen compounds and are oxidised, but most importantly NOx is formed from nitrogen and oxygen atoms in the air. This will cause the electrons in the bond to be ?pulled? more vigorously by one atom / ion and cause a dipole in the molecule. This will cause an electrostatic attraction between molecules. This is a stronger force than the first type .